At CeBIT 2015 in Hanover on Saturday, Blackberry unveiled its first new tablet in years. The BlackBerry SecuTABLET is a security-focused slate based upon a modified Samsung tablet running IBM software. The new tablet is said to deliver rigorous data security whilst allowing its users access to consumer applications such as YouTube and WhatApp. "Security is ingrained in every part of BlackBerry’s portfolio, which includes voice and data encryption solutions," said Dr. Hans-Christoph Quelle, chief executive officer of Secusmart GmbH, in a statement about the new device. "Working alongside IBM and Samsung, we have added the last link in the chain of the Federal Security Network. Subject to certification of the SecuTABLET, German government agencies will have a new way to access BlackBerry’s most secure and complete communications network in the world." The tablet was developed as part of Blackberry's efforts to expand its business and government customer base which demands rigorous data security. The extra-secure version of Samsung's Galaxy Tab S 10.5 will include a security bundle that prevents sensitive data and confidential work-related information against hackers by separating work applications from personal ones on the device. Secusmart, the company behind this tablet initiative, was acquired by BlackBerry last year as the company's strategy shifted from making hardware to building security components and software into competitors' devices, reports Bloomberg. "For many of the tasks that officials and executives need to carry out, a phone just isn’t enough - they want a tablet," Dr. Quelle said at the CeBIT technology conference in Hanover, Germany. "The most important thing is that we combine security with usability. We don't want to take the fun things away from people." The device marks the second time BlackBerry has tried to enter the tablet market. It launched the BlackBerry PlayBook tablet in 2011. However, the PlayBook tablet was not well received when it hit the market resulting in the Canadian company writing down hundreds of millions of dollars in unsold inventory. Priced at 2,250-euro ($2,380, £1,600) the new device should be available as early as this summer, according to Quelle, with over 10,000 units estimated to be shipped annually in Germany alone by next year. 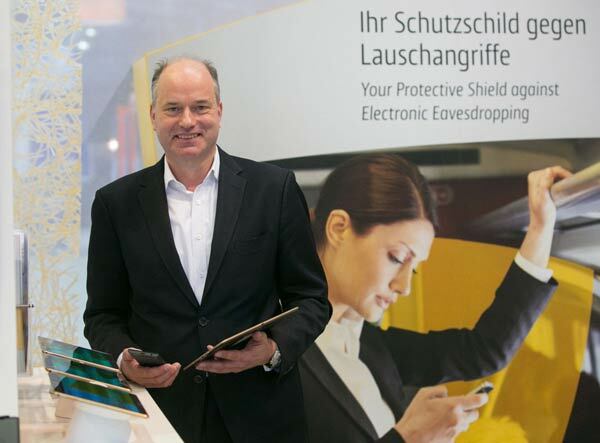 The SecuTABLET is currently undergoing German government certification for its official security rating. It is likely to be approved by the end of the year. Based on the current price of a Galaxy Tab 10.5, you'll be paying nearly £1,300 just for the security features - that seems like an absolutely crazy premium to me! Blackberry are pretty desperate right now and I guess they are trying to sway their old customers: Business users. Low volume with high profit……another stab at staying afloat. … What did i miss…?? The government certifications that are a) costly (although not that costly) to achieve, and more importantly b) give you pretty much carte-blanche to charge whatever you want. You make the only security certified tablet on the market, you can pretty much charge what you want. This is only for Government and Enterprise. This Tablet will not be available for the consumer market. It's also going to be the most secure Tablet on the Planet. Secured by BlackBerry. But its a Samsung Tablet, not a BBRY.